Heart #051 has a pattern of squares and triangles in the style of one of the patterns of the marble floor in Basilica di San Marco, Venice. Each of the heart’s two parts consists of four layers. 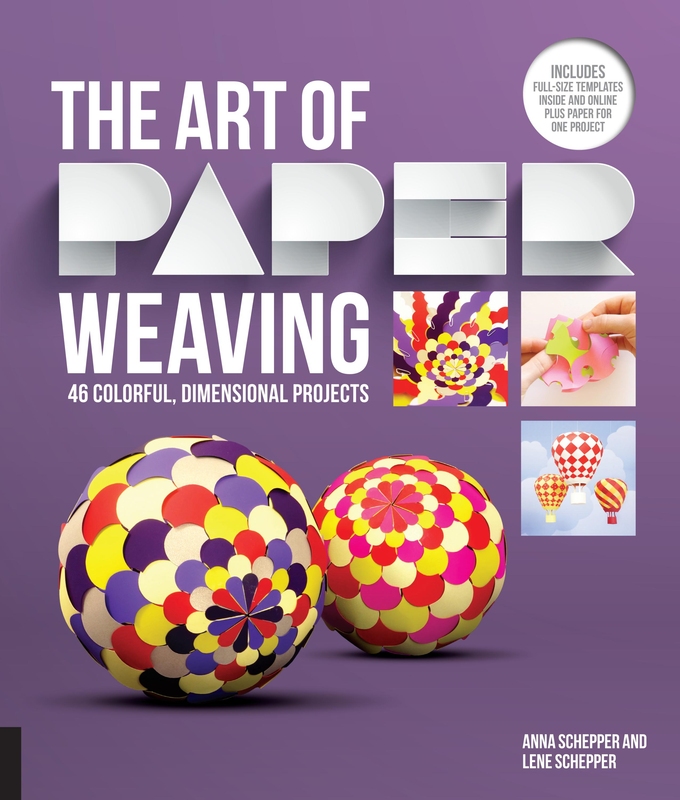 The pattern is easy to both cut and weave – weaving, however with some patience. 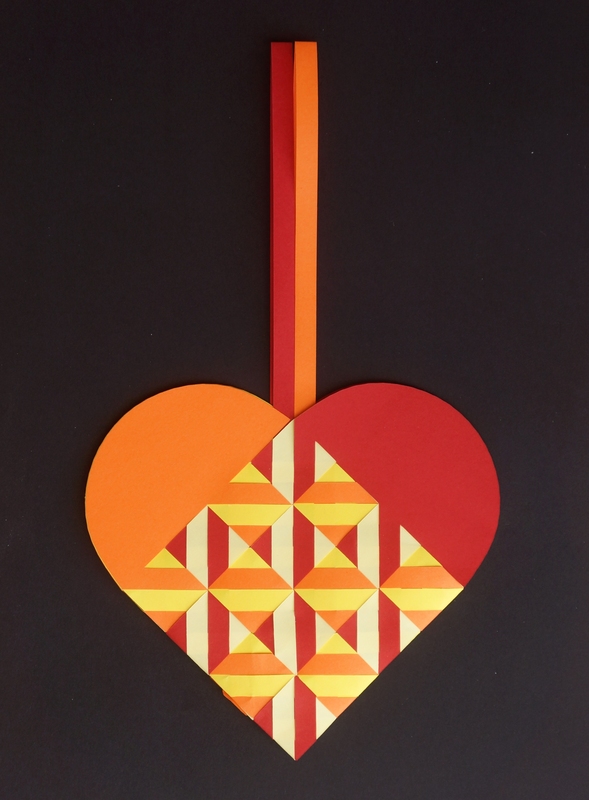 The principle is that you first prepare the two heart parts and then weave them together like a simple heart with four straight strips. Consider the pattern above carefully. What you see depends on your focus. When you focus on (1), i.e. the small square of triangles, you see a complex almost three dimensional pattern of square shaped tiles. When you focus on the center of the pattern (2) you see a checkerboard pattern where each square has a pattern of four parallel stripes. 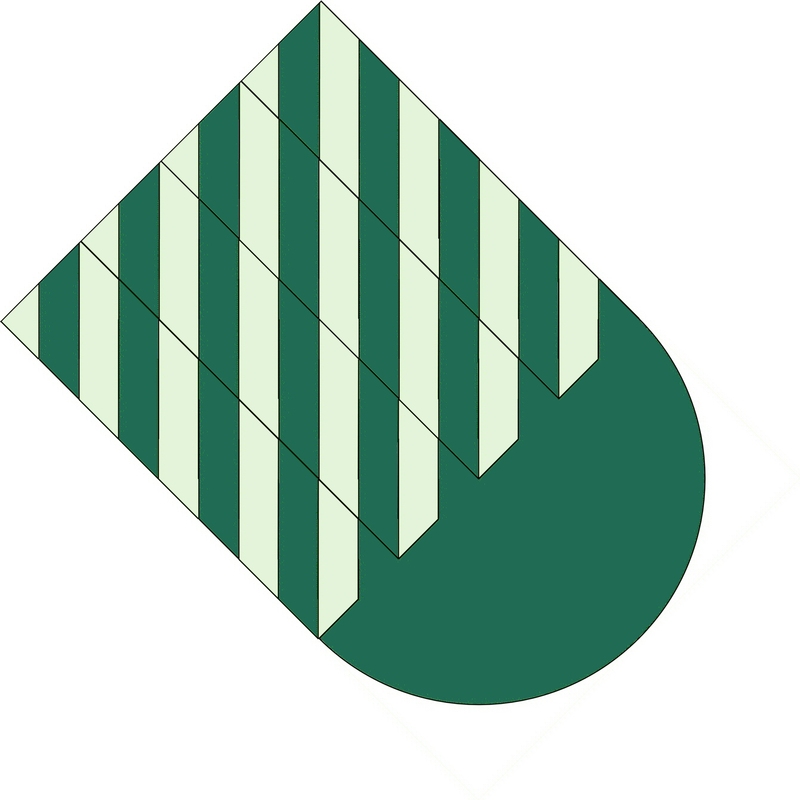 Thus the complex pattern you see when you focus on (1) may be generated by weaving together two parts with stripes. Each part is made from four slightly different pieces. For the heart’s Part 1 you need Piece 1 and 3 in colour A (dark green) and Piece 2 and 4 in colour B (fair green). Look carefully at the individual pieces. Observe how the visible base of the narrow strip in Piece 1 is located to the upper left in the small square. In Piece 2 the visible part has moved further to the right. In Piece 3 it is located in the lower part and in Piece 4 in the lower right corner. Place Piece 1 on top of Piece 2 and twirl each strip individually. 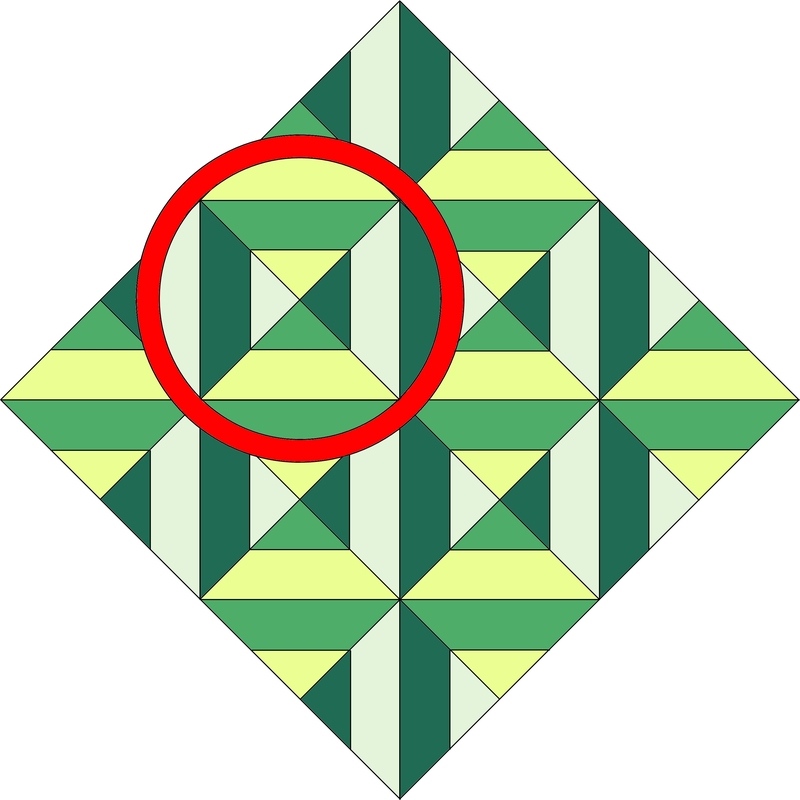 You twirl the strips by pulling the strip below (first step: fair green) gently to the right and placing it on top of the other (first step: dark green). Start aligning the strips near the blades and work towards the center line. Continue until all has been twirled like indicated. Place Piece 3 behind the twirled Pieces 1 and 2 and twirl strip by strip. Place Piece 4 behind the twirled Pieces 1, 2, and 3 and twirl strip by strip. 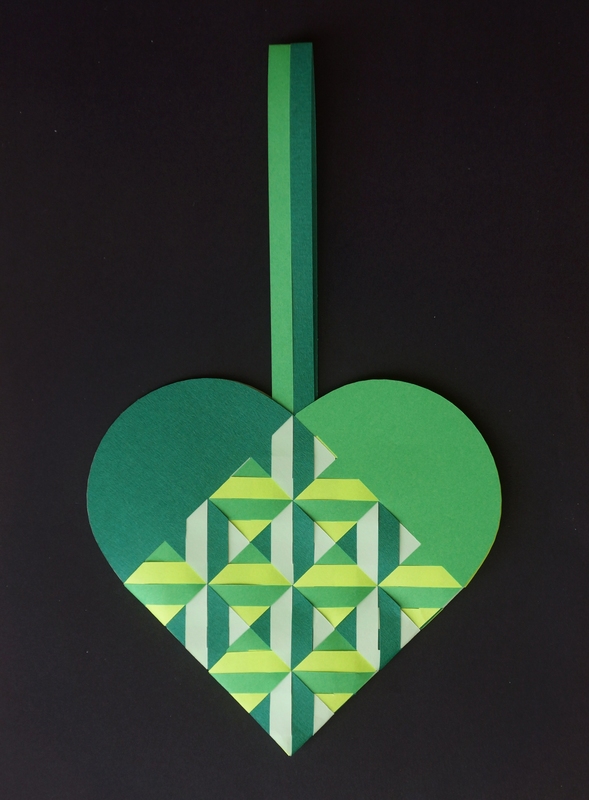 For the heart’s Part 2 you need the same shapes: Piece 1 and 3 in colour C (green) and Piece 2 and 4 in colour D (light green). Twirl also these four pieces starting with Pieces 1 and 2. Next thing is to weave the heart. 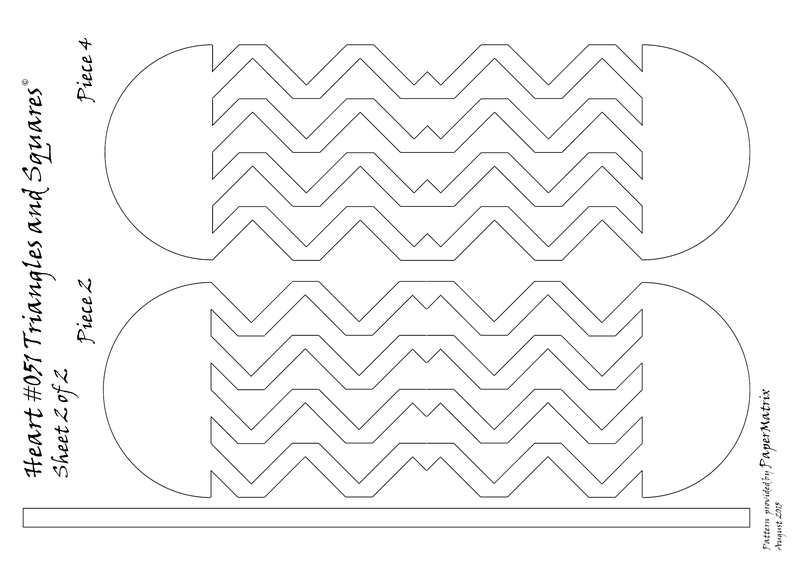 Take care to line up the pieces correctly to obtain the pattern you plan. 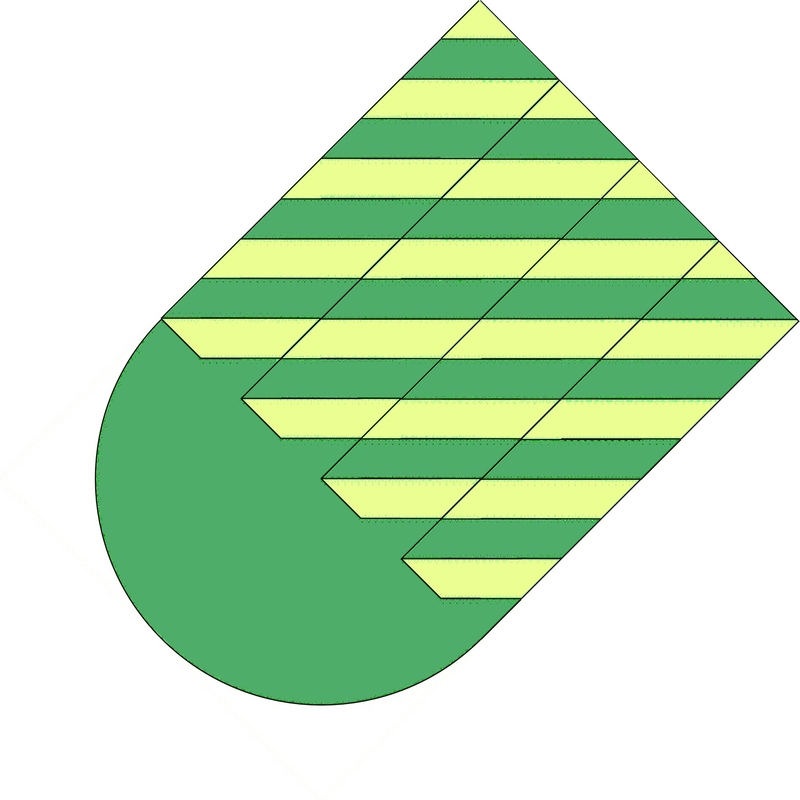 Fold the two heart parts along the short line of symmetry and place them as indicated. To get the correct pattern it is important, however, that you start in the right way. The first square you weave, i.e. 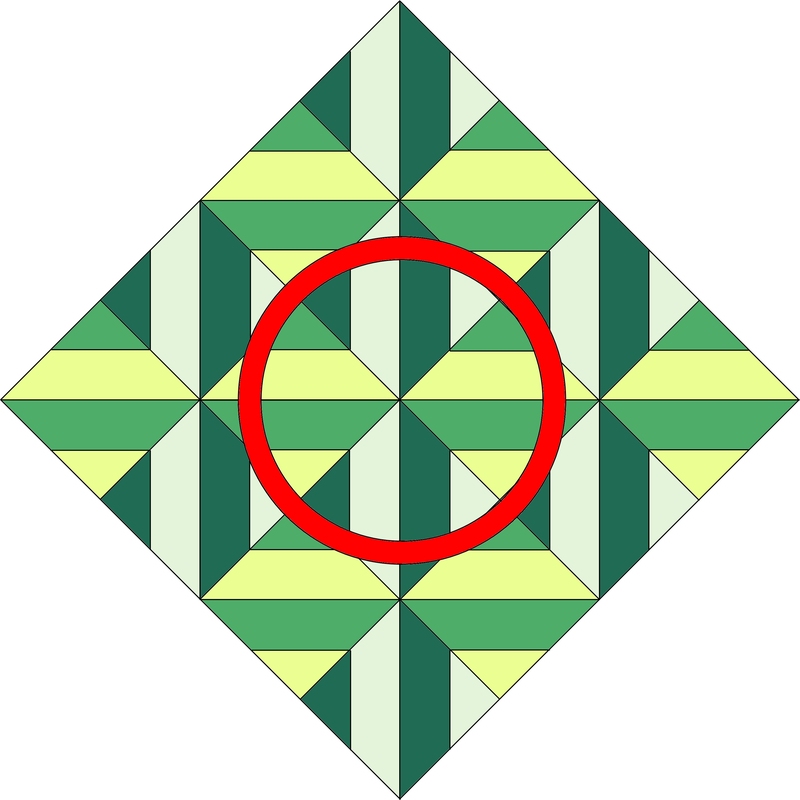 the square between the heart’s blades must show vertical lines (dark green/fair green) and NOT the horizontal line (green/light green). Weave strip by strip just like you would weave a basic heart with four straight strips. For weaving the last row of squares a pair of tweezers is a good help. 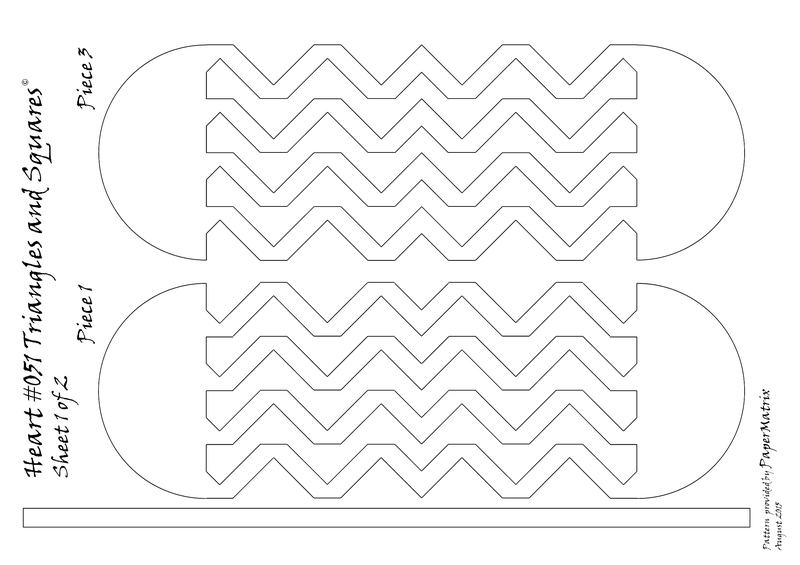 If the narrow strips entangle and turn impossible to weave wrap the strip you are inserting in a short piece of folded paper and upholster the inside of the other likewise. Add two narrow handles in the colours you prefer. 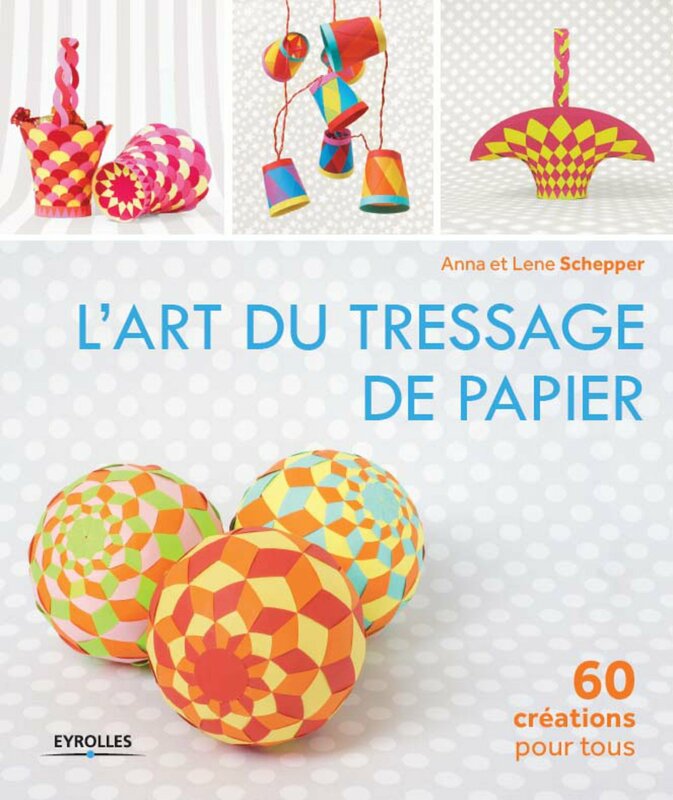 You may plan the colours to enhance the pattern. 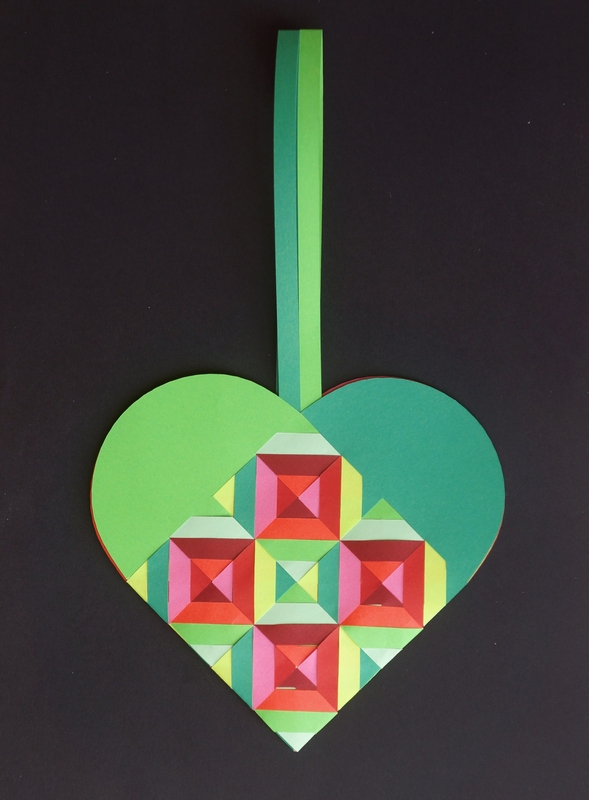 This heart is made from the templates above but in eight different colours. Consider the small squares to figure out the colour of the individual pieces. 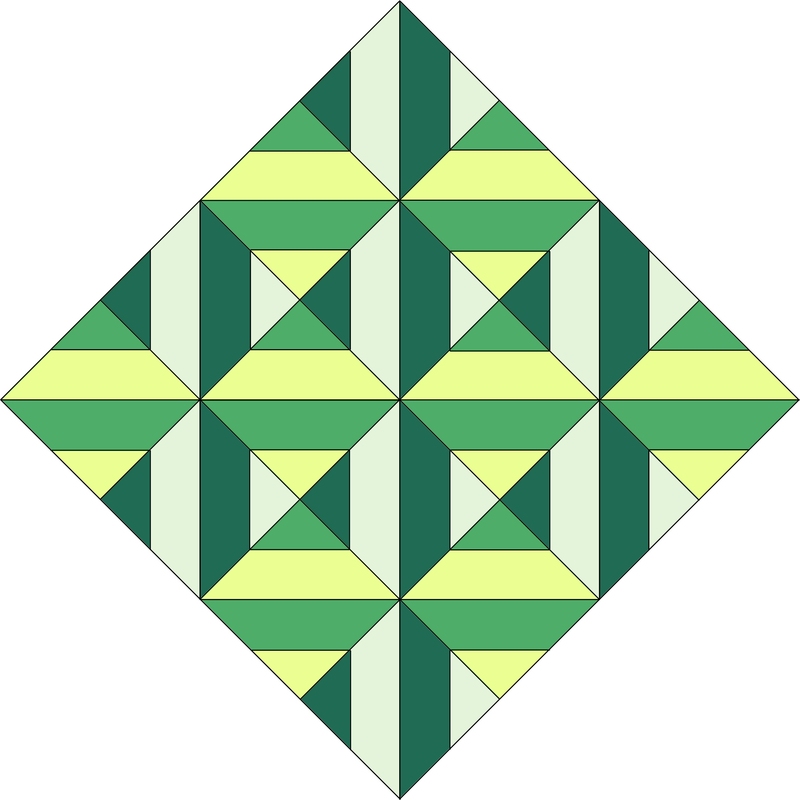 Also the first square is woven with horizontal stripes.